The origins of Tug of War are uncertain, but it is beyond dispute that this once royal sport was practiced in ancient Egypt and China, where it was held in legend that the Sun and Moon played Tug of War over the light and darkness. Tug of War stories about heroic champions from Scandinavia and Germany circulate Western Europe where Viking warriors pull animal skins over open pits of fire in tests of strength and endurance in preparation for battle and plunder. 1800 – Tug of War begins a new tradition among seafaring men who were required to tug on lines to adjust sails while ships were underway and even in battle. The Oxford English Dictionary says that the phrase 'tug of war' originally meant the decisive contest; the real struggle or tussle; a severe contest for supremacy. Only in the 19th century was it used as a term for an athletic contest between two teams who haul at the opposite ends of a rope. 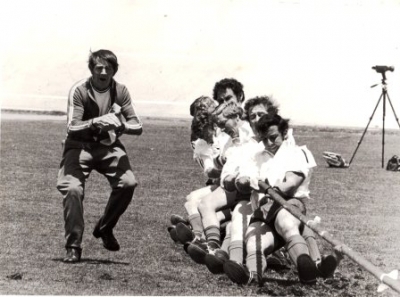 The Sport of Tug of War has been prominent in Ireland for at least 200 years. In the old days, the sport was part of the basic training of the Constabulary of Ireland with each district having a team with there being approximately 128 districts throughout Ireland. Up to the beginning of the last century teams comprised of ten men and generally competitions took place at only two weight classes viz 104 stone and catch weight. It was usual for teams to take up position, one on each side of the rope alternatively. At the time it was considered that this gave a better balance to the team. Very often, judges were local dignitaries who were interested only in winning the pull, not how it was won. The rules were very basic and certainly had no comparison with present day regulation. It was not unknown for teams, during a long pull, to twist on the rope, slipping it across the shoulders and therefore making a very effective lock. Instead of the present four meter pull, it was traditional in some areas for the pull to continue until every member of the opposing team had been pulled across the line. It was little wonder, in such circumstances, that contests’ sometimes lasted up to a hour or more. In 1895 the Belfast team were declared World Champions, having competed at home and abroad against all comers without once losing a pull. They continued to compete for a further four years without defeat or losing a pull. During the Great War the sport was kept alive by the army and the Royal Irish Constabulary alongside the famous Guinness team from the works well known beverage makers. With the partition of Ireland in 1920, the sport continued to be very popular in Northern Ireland, especially in the 1930s’. 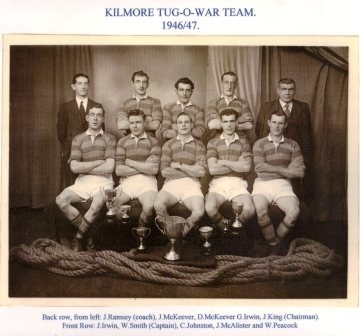 In that era the most successful teams were from the Royal Ulster Constabulary, continuing the results from the RIC, winning both the lightweight and heavyweight championships at the British Amateur Athletic Championships from 1931 to 1939. From the late 1950s onwards a great rivalry developed between the Mountpottinger team and Aghadowey. The Aghadowey team came from farming stock and was built around the Barr Brothers who were World famous Ploughmen. Hugh Barr was World Champion three years in succession. At one time there were five brothers in the team along with a brother in law. 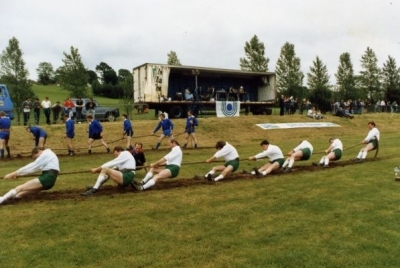 Matches between Mountpottinger and Aghadowey are part of the folklore of Tug of War in Northern Ireland. 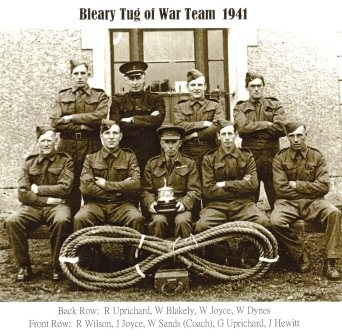 After the formation of the English Tug of War Association in 1958 it was logical that Northern Ireland should form its own Association and this duly took place in 1964. The following year saw the first ever European Championship in Crystal Palace, London. Northern Ireland finished in Runners up position behind England. 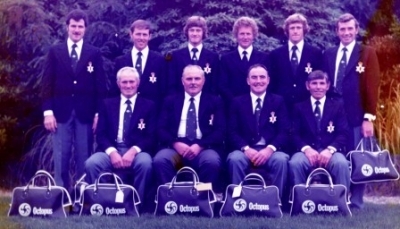 The Aghadowey team who represented the province on that occasion was one of the best club sides around at that time and it was very appropriate that they should eventually take the European Title at 640kgs at the same venue of Crystal Palace in 1970. The following year a new team from Garvagh went to the European Championships, bringing home a creditable Silver Medal. In recent years, after somewhat of a decline, Northern Irelands International standing has risen dramatically largely due to the Richhill Club. This club is one of the best lightweight teams in the World having taken Solver and Bronze medals at World Outdoor level and winning two world indoor championships back to back at 560kgs indoor. In addition to major Championships, representative teams from the Province undertook major tours of the United States, Australia, China and other nations. They were the first teams to visit USA and Australia since the International Federation was formed and apart from being undefeated on both tours, their trail-blazing was very beneficial to the development of the sport in these far off countries. ANYONE WITH FURTHER INFORMATION OR PICTURES OF TEAMS FROM THE PAST PLEASE FORWARD DETAILS TO NITOWA SECRETARY.